Update 2018: want more Instant Pot cooking?? Get 36 easy recipes, tips, and tricks in my new Instant Pot for Beginners eBook! Click below to get your copy! 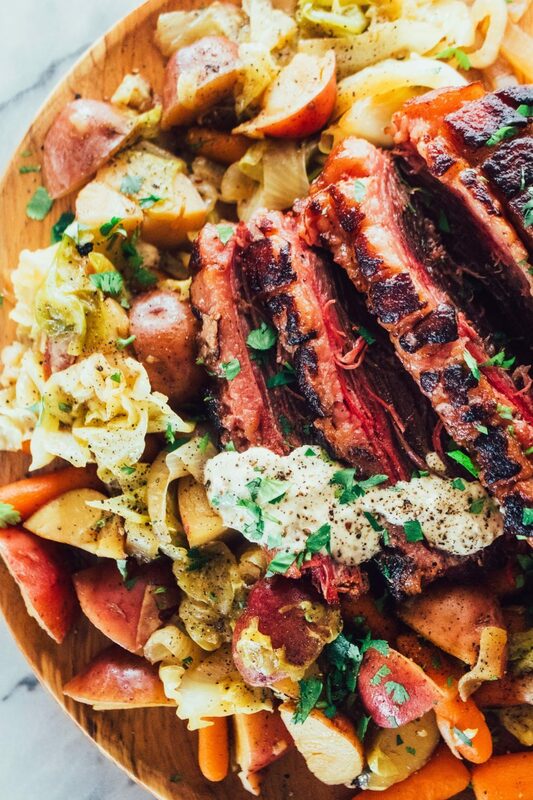 Corned beef brisket and cabbage is one of my favorite meals of all time. Quite possibly would be my preferred last meal before I die. Wait no, that’d definitely be tacos. It’s unfortunate there are so many really crappy ingredients in most store-bought variations. The corning brine does *not* need all the preservatives they include. This is the third year I’ve made my own corned beef for St. Patty’s Day, skipping last year to try an organic option from Whole Foods (bad idea). Homemade is always better. Why am I always learning this lesson the hard way btw? Make a brine with a homemade pickling spice mix. Lots of fragrant seeds and spices make the combo below a tried and true favorite. Let the brisket brine for at least 7 days in the fridge. Pressure cook it and voilá! Alcohol is optional but makes it tastier IMO and a bit more traditional. Plus cooking your cabbage/onion/carrot/potato combo in the resulting liquid is so damn good. Pat the brisket dry and score hatch marks into the fatty side about 1/2″ deep. Place the brisket in a gallon ziplock or similarly sized tupperware or bucket and place it back in the fridge. Make the brine by adding the water, celery seeds, mustard seeds, ginger, onion powder, cloves, allspice berries, juniper berries, bay leaves, cinnamon stick, honey, and beet powder to a large stock pot. Bring to a simmer over medium heat, stirring occasionally to dissolve the salt. Turn off the heat, place a lid on, and allow the mixture to cool to room temperature. Once cooled, pour the brine into the ziplock with the brisket, making sure to move all the herbs and spices to the bag, as well. Seal and place inside a 9×13 (or similar) pan to catch any possible leaks. Leave in the refrigerator for a minimum of 7 days but up to 21 days. The longer you leave it, the more flavor will be infused (but 7 days is plenty!). After it’s brined your desired length of time, remove the brisket from the bag and discard the liquid. Rinse the brisket and remove any seeds, etc from the outside. Dry the brisket really well with a tea towel. To cook: set the Instant Pot to “Sauté” and adjust to “More” heat. When the display reads “Hot,” add the cooking fat and the brisket. Brown on both sides until dark, about 5 minutes per side. Deglaze with the white wine, add the broth (or broth/alcohol combo, if using — see below), and cover with the lid. Turn the Instant Pot off. Set the Instant Pot to “Manual” and adjust to “High Pressure.” Set the cook time at 70 minutes and turn the vent to the “Sealing” position. Once the brisket has finished, allow the Instant Pot to release steam naturally for 15 minutes before using the Quick Steam Release for the remaining pressure by turning the vent to the “Venting” position. Remove the brisket and cover with foil to rest until serving. If serving with onion, cabbage, potatoes, and carrots, chop everything up and add it to the broth in the Instant Pot. Cover with the lid, set to “Manual,” and leave at “High Pressure.” Adjust the cook time to 2 minutes and turn the vent to the “Sealing” position. When the cook time has completed, use the Quick Steam Release method by turning the vent immediately to the “Venting” position. Strain the broth out from the veggies. Optionally you can reduce the broth to create a sauce to serve with the brisket. Pour it back into the Instant Pot, set to “Sauté” on “More” heat with the lid off for at least 20 minutes. Serve with a creamy horseradish, as desired. Recommended: throwing the brisket slices into a hot cast iron skillet to briefly crisp up one side, along with the fatty parts. To take the flavor up a notch, you can swap out two cups of the broth for a dry hard cider (Strongbow is a good one) or a gluten-free ale. This is particularly delicious to cook the veggies in after the brisket is done. If you opt for this, you can skip the white wine. For a larger sized brisket, you shouldn’t need more brine but you will need something larger than a gallon ziplock to hold it. Scale the cook time by 10 minutes for every 1/2 lb. larger than 3 1/2 lb.